Sparta was one of the most efficient and strongest of the Leading Greek city states in its time. The Spartans were highly organised and their land based army was almost untouchable, both in its battle skills and it’s mastery of warfare tactics and fighting. At a young age the soon to be Spartan warrior would be taken from their home, this was usually at around six or seven years old. The young Spartan’s would then be trained with battle as their primary purpose in life, trained to be ready for any war or fight. Additionally it is both alleged that they were taught to read and write and also conflicting stories say that they weren’t, but regardless it would have been a tough upbringing, allegedly encouraged to steal, but not to be caught, the young Spartans would be provided with basic food and clothing needed to survive but nothing more. When the young Spartans reached twelve, their training would be increased dramatically with more discipline and training introduced. Extra work and tasks were often delegated to the young Spartans of this age. Later when they had matured at age twenty, they were considered by the state to be full warriors and deemed ready to join the Spartan army. 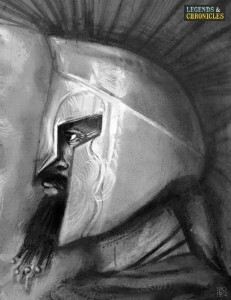 Once the Spartan warrior joined the army they would become almost brothers with the group of men who they trained with. They were recognized as one of the Spartan’s, called ‘Hoplites’ and now they were forbidden to work in any monetary fashion. When the Spartan reached thirty years old, they would be given a plot of land and this would be farmed for the Spartan warrior by one of the state slaves. The produce grown from the land would allow the Spartan to eat and survive for the rest of his life. 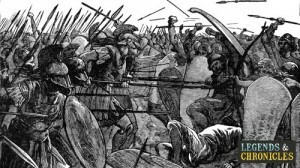 The Spartan army was considered one of the strongest of its times, it was smart and through it natural selection, and its training, the soldiers that emerged from their training were some of the most efficient fighters the current world had ever seen. While Sparta was well know for having great warriors who were excellent on land, the Spartan army also branched out and became skilled at fighting on the sea’s too. At one point the Spartan’s had their own navy which was used to attack their enemies and defend their land. Their reign of the sea proved however to be short lived and the Spartan ships were viciously defeated in the battle of Cnidus in 394BC by the aligned Athenian and Persian fleet. Like a lot of amides, the equipment of the Spartan warriors has had variations and changes throughout the periods they existed. The most well known of these looks would undoubtedly be the Persian war outfit made famous by the graphic novel 300. While Spartans were great fighters this would mean body armour would not be as essential as with other warriors, but regardless of this they did not skimp. The Spartan warriors armour did change over time but they would usually have a chest plate to protect themselves from melee attacks to their torsos, bronze cuirasses, Leg greaves and a helmet most typically in the Corinthian style. Weaponry would consist of a spear know as a Dory, which was very large and rather unwieldy, the Spartans however were more skilled at using than their opponents were with lesser weapons. The Spartan warriors would also carry short sword which was used for stabbing when in close quarters. For defence they would carry a hoplite shield known as an Aspis, this would big enough for them to carry a wounded comrade in and would require great strength to use effectively in the battle, fortunately the Spartans always possessed this.